If you have any questions or suggestions you are welcome to join our forum discussion about Picking Highs and Lows on Inside Days Using Bollinger Bands . We have underscored multiple times that trend trading is what novice traders should practice and avoid going against the market at all costs. However, even though following the trend is the most secure way to profit from the financial markets, it still comes hard for many beginners. The logic behind buy low – sell high or buy high and sell higher is quite sound and straightforward, but it requires to determine when a market top is the trend’s last high, or it will be followed by a higher high. Being able to make the right prediction will make the difference between going long and riding the trend up, going short and getting the reversal right, or doing exactly the opposite and being wrong. The current article will present to you a trading strategy aimed at accurately pinpointing swing highs and lows that have a large chance to be followed by a reversal. 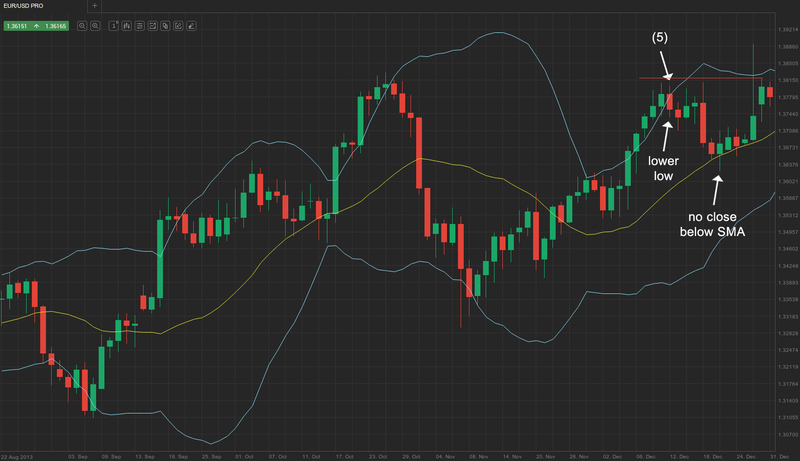 It is based on Bollinger Bands, but not solely. Although prices which touch, undershoot or overshoot the Bollinger Bands are considered as high or low, you can’t rely fully on these indications because exceedingly strong trends can ride these boundaries for a protracted period. Thus, we will need additional confirmation to determine whether the move’s strength has been exhausted, or will continue its course. As such, we will incorporate a filter which shows market exhaustion and generates a counter-trend move. We will enter the market after the price has touched one of the BB boundaries, only if the following bar does not hit a new high or low, thus is an inside bar. It signifies a period of contracted volatility, which means that the previous market move’s strength is declining and the chance for a reversal is much higher. Thus, the combination between Bollinger Bands and inside bars helps you enter on reversals by selling exceedingly high or buying exceedingly low prices. Let’s continue with the specifics. This strategy is most commonly used on a daily time frame but everything higher than the hourly chart will also work well enough. By default, Bollinger Bands run a trackback period of 20, which is what we will use for our example as well. 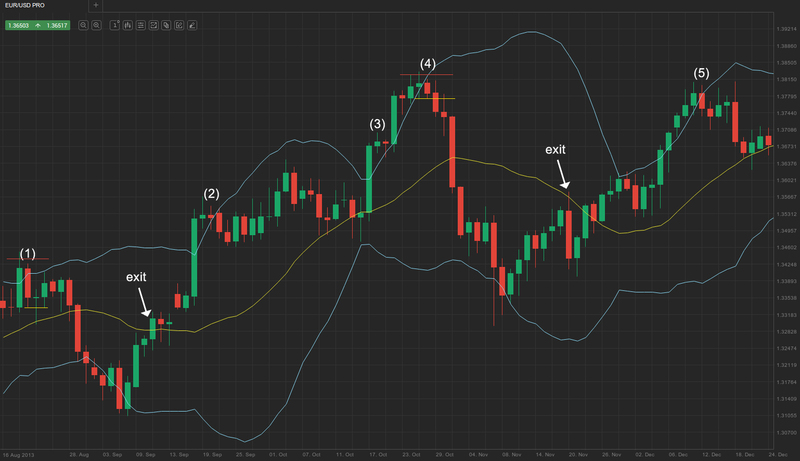 The first step is to look for a point where the currency cross touches or closely undershoots the lower Bollinger Band. As soon as it happens, you need to wait and see whether the next bar’s low is higher or at most equal to the low of the bar which interacted with the Band. Moreover, its high must also be lower or at most equal to the previous bar’s high. If all these conditions are met, the second bar becomes a signal bar, and we enter on the third one, as soon as it breaks the signal bar’s high. Our initial stop will be placed several pips below the low of the second (signal) bar in order to avoid random noise triggering it. As the price retraces back up and reaches the 20-period moving average, we trail our stop to the 20-period SMA after a bar closes on the opposite side of it. Our trade will then be exited as soon as the price reverses and crosses the SMA from above. Thus, this strategy seems to be fairly simple to incorporate in your trading plan, which is one of its main advantages. You can easily measure your risk exposure and use it on different time frames, making it suitable for many types of traders. However, keep in mind that the shorter the time frame is accompanied by a higher chance for a false entry signal to be generated as the smaller chart encompasses less data, thus does not reflect crowd behavior entirely. Also don’t forget that you can alternate some of the strategy’s parameters, especially when it comes to the trade’s management. For example, instead of waiting for the price to reach the SMA to trail your stop, you can exit half of your position as soon as you reach a profit of 50% or 100% the amount risked and then trail your stop to breakeven. After that you can manage the remainder of the position according to the rules we outlined earlier. This is just another, more conservative, way to manage your money. You are looking at the EUR/USD pair on a daily time frame and 20-period BB. At bar (1) the market formed an inside day within the previous bar, which was the first to penetrate the upper Bollinger Band. We enter the market as the next bar breaks the signal bar (1)‘s low, as marked by the yellow line. Stop-loss is placed several pips above the signal bar’s high, visualized by the horizontal red line. As soon as the price reached the SMA and a bar closed below it, we trail our stop to the SMA. Our position is exited as the price then reversed and crossed the SMA from below. Right before bar (2) the market once again penetrated the upper Bollinger band, but did not generate a short entry signal as bar (2) was not an inside bar relative to the previous one and neither was the next bar relative to bar (2). As you can see, we were right not to enter at that position and it would have been a loser. There was another boundary overshoot right before bar (3), but once again there was no inside bar and we were right not to enter. However, shortly after we were presented with a suitable entry point. The market closed above the upper Bollinger band for 7 consecutive bars, and bar (4) was the first one to form within the Bollinger Bands channel. Moreover, it was an inside bar and so using our strategy here would be reasonable. We enter the market as soon as the next bar penetrates bar (4)‘s low, as marked by the horizontal yellow line, while our protective stop is placed several pips above bar (4)‘s high. Just like the previous trade, we trail our stop on a closing basis with the SMA as soon as the price reaches it, and our position is later closed when the SMA is crossed from below. Later, shortly before bar (5), the upper Bollinger Band was once again overshot, but bar (5)‘s low exceeded the preceding one’s low, failing to generate a short entry. This was another good call not to make the trade because our initial stop would have been hit. Check out below how the market movement developed. As you can see, even if we had entered below the low of bar (5), there wouldn’t have been a single bar to close below the SMA, therefore we couldn’t have trailed our stop. Several bars later a rally which penetrated the upper band would have gunned out our initial stop, rendering our trade a loser.